By LUDWIG VON KOOPA - Could Nintendo Prevent Doom From Artoon? There is a chance that Yoshi's New Island could be decent. There is no chance that it will be as good as the original Yoshi's Island since Arzest, the crappy company formed by Artoon people (also crappy), is doing the work. But it could be decent, according to information provided by Takashi Tezuka, the series producer in an IGN interview. Speaking of the development team, Tezuka told me that Arzest, the developer behind Yoshi's Island DS, has joined Nintendo's designers once again to work on this project. Tezuka did note that Nintendo's role on New Island, which includes himself and developers from the New Super Mario Bros. projects, is to oversee level design. Back in Yoshi's Island DS, Tezuka was "Senior Producer". That game's level design was notably weak, along with its music and... well, every other aspect of the game. Looking at YIDS's credit list, one sees that most of the designers and programmers are Artoon employees who haven't worked on any other major project or company. These are clearly an assorted group of untalented misfits and losers. As long as Nintendo does all of the creative work (and musical work) and enslaves Arzest to just be code monkeys that toil to match the whim of Tezuka and his team, then Yoshi's New Island could theoretically turn out alright. Go ahead and compare the Castle/Fortress music between the two games. This is a major, important theme that plays on the most plot-critical stages. Then again, Tezuka is also working on projects such as Yoshi's Epic Yarn on the Wii U (with actually COMPETENT developers... You rock, Good-Feel!) that probably don't enable him to micromanage Arzest. ...So the theory will likely be a bust. The New Super Mario Bros. team isn't really doing anything after New Super Luigi U, which is just an expansion pack and already done. I mean, there is only one NSMB game per Nintendo system so we already hit that cap. And if they have nothing to do... why not spend that time enslaving Arzest? Right? Part of that team actually includes Kenta Usui and Yasuhisa Yamamura specifically in level design, and they both worked on the first Yoshi's Island! Sure, the latter was a "Supervisor" for the sexually transmitted disease game, but back then he could just be sleeping at the wheel. NOW Tezuka specifically says that Nintendo has an actual role this time! 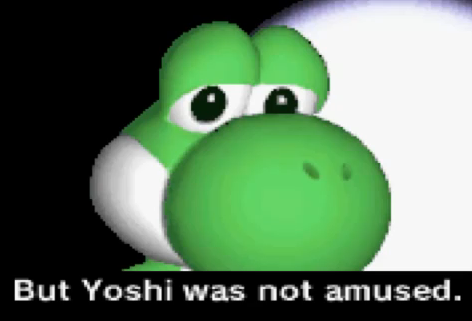 Yoshi's Universal Gravitation literally made me depressed after watching its ending on YouTube. Artoon is THAT bad. Seriously, what's with Bowser walking through the floor? And that Artoon-composed MUSIC? This was on the legendary Game Boy Advance, not the Atari 2600! ...Actually, scratch that, the Atari 2600 had BETTER music. Ludwig doesn't want to keep having to worry about Yoshi's New Island, but he feels very passionate about how Arzest continues to be a pest. Check out some of his passion on Miiverse by Following him at NNID PrinceOfKoopas.